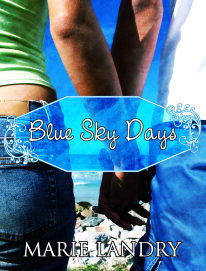 Today we’re interviewing the lovely Nicholas from Marie Landry’s novel Blue Sky Days. Definitely our most interesting character interview so far – take a look and you’ll see why. Hi Nicholas – thanks for joining Aside from Writing today, we’re really pleased to be in Riverview to meet you. For people who are not aware of your situation, would you mind giving us some background? Thanks, it’s great to talk to you today. I was diagnosed with leukemia around the beginning of September. I work in construction, so I’m used to long hours of hard work. It can be tiring, but I’m a pretty energetic guy, and I like to stay busy. When I started waking up tired, and then staying tired and listless during the day, I knew something was wrong. I hoped it was the flu, but I didn’t have any other flu-like symptoms. My mom died of leukemia when I was a kid, so that was always in the back of my mind. I went to the doctor almost right away, and within two weeks, they’d diagnosed me, and shortly after that I started treatments. And so – you’ve just spent the last few days in hospital and had your first chemo sessions this week. How’s that been? Not as bad as I expected, to be honest. I know it’s going to get worse as time goes on, but this week was more…strange than anything, I guess – having to leave home, check into the hospital, be away from my normal life. It was easy to pretend that the doctors were wrong and I didn’t really have cancer, but when they stuck that IV in me and I started my first treatment, it was impossible to deny. This is obviously a really tough thing for anyone to go through – what helps you to cope with the difficulties you’re facing? Love and support from friends and family. I don’t think I could get through this without my dad, my girlfriend Emma, my two best friends, and Emma’s aunt Daisy. They’ve been incredibly supportive, and they don’t treat me like a cancer patient who needs to be protected or coddled. We met Emma outside 🙂 you guys are obviously very close – how have things been for her since you found out about your illness? Well…it hasn’t been easy, but she’s been…god, I can’t even tell you how amazing she’s been. When I first found out I was sick, I wanted to keep it from her, to protect her. We’d had this incredible summer that was the stuff of daydreams, and dumping all of this on her just seemed like such a huge burden to put on someone so young. She might kill me for saying this, but she’s got this sweet innocence about her, and I didn’t want to ruin that. I know how stupid I was now, though. She’s been so strong, and she’s been there every step of the way, from doctor’s appointments, to walks to help me keep my strength up, to spending time with me in the hospital and sitting with me during my chemo treatments. So – you’ve not been together a huge amount of time then? OK – then let’s talk romance if that’s alright…? How did you and Emma first meet? I met Emma when she first moved to town to live with Daisy. I was walking in the park one day and I sat down to read, and she was sitting at the top of the hill. The minute I saw her, I knew I had to go talk to her. And – can we ask – was it love at first sight or do you not believe in that? As cheesy as it sounds, yeah, it was definitely love at first sight – for me, anyway. I saw her sitting there at the top of that hill, looking like an angel with the sun streaming down on her, and that was it. My whole life changed in that one instant. Well – I’m sure she’ll be pleased to hear that if she’s listening outside right now 🙂 So – tell us what else are you doing while you’re home this weekend? This weekend is all about normalcy, or at least as close to normal as you can get when you’re exhausted and weak. For months, it’s been the six of us – Dad, Daisy, Vince, Maggie, Emma, and me. We’re going to spend as much time together as possible before I have to go back to the hospital on Monday. Nicholas – thank you so much for joining us today – we hope you have a great weekend at home and wish you all the best for your ongoing treatment. 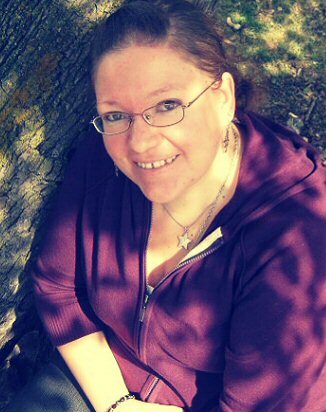 This entry was posted in Character Interviews, Interviews and tagged author bio, blue sky days, buying links, cancer, character interview, chemo, interview, interviewing nicholas, marie landry, nicholas, radio interview, Riverview, website. Bookmark the permalink.